Shocking news has come from Haldwani where a 14-year-old boy lost 22 liters of blood in last two years due to hookworms. He faced a serious problem that also put the doctors in the situation of a dilemma. Doctors have inserted a tiny wireless camera inside the small intestines of a boy and saw two distinct images. The first half of the intestines appeared normal but the second half had turned blood red. These hookworms, if not diagnosed early, can cause immense blood loss and complications. The case was published recently by Department of Gastroenterology at Sir Ganga Ram Hospital in the Journal of Infectious Diseases and Therapy. “The case showed that hookworm manifestation, if not diagnosed timely, can not only lead to their multiplication but also immense blood loss and complications,” the doctors noted. “Manifestation of hookworms can be prevented by avoiding walking barefoot and maintaining food hygiene,” said Dr. Arora. Earlier, doctors suspected that the boy was suffering from anemia. But when the situation was not in control with the medication and heavy blood loss was found from the body, then doctors conducted a capsule endoscopy, in which they found dancing worms actively sucking blood in the mucosa of the small bowel. Doctors had, for a long time, suspected that the boy was suffering from anemia. 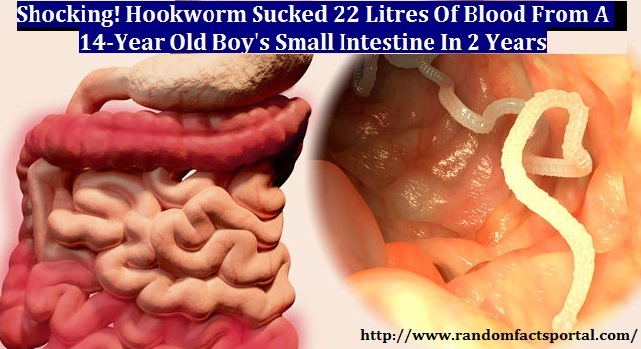 But with medication not having the desired effect, doctors conducted a capsule endoscopy, during which they found dancing worms buried in the mucosa of the small bowel, actively sucking blood. According to reports, hookworm is a common problem in India and can be faced by anyone at any stage. But this case was different because the boy had very low hemoglobin and not diagnosed for two years. He had no fever, abdomen pain, and diarrhea. He was treated as an anemic patient and received 50 units of blood during the treatment. 1. Hookworm infestation can be prevented by not walking barefoot outside the door. 4. Wash your hands as often as possible.